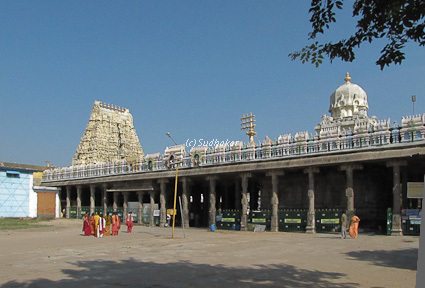 Sri Nilathingal Perumal sannidhi is situated inside the Ekambareswarar temple, Kanchipuram. This temple is around 2000 years old. 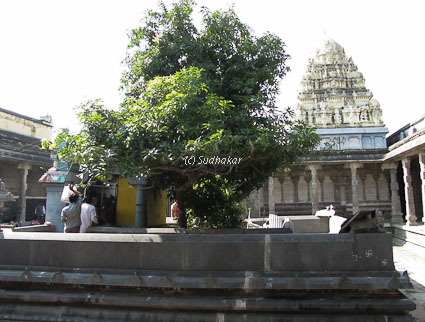 There are a few legends behind the Nilathunda Perumal. The legend goes likes thus - Lord Maha Vishnu in Koorma avatar (form of Tortoise )to support the Meru Mount used as the churn to churn the 'paar kadal' . Serpent Vasuki who was being used as the rope, spit its venom which fell on the Vishnu who was in the Tortoise form, blackening His blue skin. Treatments to restore the original color were of no use. Lord Brahmma suggested that worshipping Lord Shiva will remove the blackness and restore His original shade. 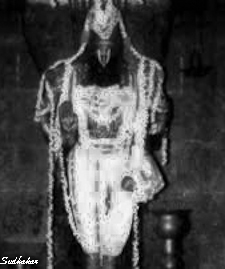 Vishnu performed penance on Lord Shiva, who granted darshan. The Crescent Moon on the head of Lord Shiva spread his rays on Lord Vishnu. The black color disappeared and recovered His own alluring blue skin color . As Vishnu got back His skin colour through the rays of the Moon, He is praised as Nila Thunda (crescent moon) Perumal.